Into the pot I threw my sighting of Brad Pitt one day in 1996—Academy Awards day, as I recall—at the diner beside the Mayfair on Franklin Avenue. I was having lunch with a friend, the fine actor who played the lead in my Off-Off-Broadway play, A Journal of the Plague Year, when Pitt walked in and joined Gwyneth Paltrow at the only other table with customers (small world: I shared an elevator ride with her mother in New York two years earlier). Naturally my friend was so impressed with the neighborhood (which around that time also provided the setting for the classic Swingers) that he took an apartment at the same strange, Scientology-flavored complex as myself, actually became a Scientologist and promptly dropped me. The fire, too, is based on a real one. When I lived in Silver Lake the city condemned the sprawling house behind mine and its drug-dealer residents moved out. One night I was just falling asleep when my cats came creeping past onto the sunporch, attracted by a crackling sound that I drowsily assumed was someone walking on the dry leaves of the condemned house’s lawn; when the cats instantly fled down the hall and into a closet, I got up to see what was going on and found myself looking at a 30-foot tower of flame 20 feet away. The condemned house—called “the Silver Lake mansion” on TV news accounts of the fire—burned down, as did another house just two away from mine. The whole experience was scary. Around that time I had a wonderful Mexican roommate whose unusual citizenship quandary closely resembled my protagonist’s, though how my protagonist resolves his is my invention. The driver of the Cadillac emblazoned with signs pleading Cast Me—Hollywood anxiety made all too visible—was locally famous; I even saw a short subject about him on IFC. But I can testify from personal experience that he actually made his living by knocking on doors and in intimidating fashion offering to refresh the paint of one’s address’s numerals stenciled on the curb. And the giddy excitement when a certain pink Corvette drove past? Something I witnessed several times. 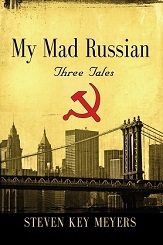 The story of My Mad Russian harks back to the 1930s when Walter Rosen and Lucie Rosen sponsored Dr. Lev Theremin and his remarkable electronic instrument, on which Mrs. Rosen became the best known amateur, touring North America and Europe. I came to know the story—including Theremin’s subsequent mysterious fate—when I had the extraordinary good fortune to be hired at the age of 17 as underbutler at Caramoor, the Rosens’ great country estate in Katonah, New York most famous for its music festival. The long-widowed Mrs. Lucie Bigelow Dodge Rosen had died a year earlier, but her house was permeated still with her presence and that of her husband, and their faithful retainers, Martha and Robert Clark, my supervisors, spoke of them endlessly. My memoir I Remember Caramoor captures this period, I hope charmingly. My plot is fanciful—entirely made up; I was assured that Mrs. Rosen was faithful to her husband. Contributing to the story, along with the legends and anecdotes I heard, was my reading of Mr. Rosen's business correspondence. It amuses me to begin the story proper at the famous 1913 Armory Show, partly because one of its organizers Mabel Dodge, later Mabel Dodge Luhan, was a friend of my grandmother’s in Santa Fe. To this day my father remembers the abject terror of being presented as a very little boy to Mrs. Luhan. “Friends Surprised” was the real headline on the New York Times story about the Rosens’ wedding. The book’s unusual structure was suggested by how central to their identities their collection and estate seem to have been to the Rosens; it seemed right to me to trace over the course of many years the conception of, collecting for and building of their country house. The opening chapter might be an unconscious take-off on Jack Benny’s most famous punchline: “I’m thinking, I’m thinking.” If so, the influence is direct: I watched Benny’s TV show, convulsed, from the age of five. The Tesla connection arises from whatever it was that Mrs. Rosen’s mother, Flora Bigelow Dodge Guest, did or did not have going on with that eccentric inventor. Col. Dead Eyes was suggested by a uniformed Russian military officer who happened to receive a guided tour of Frank Philips’ fabulous Woolaroc Museum in Bartlesville, Oklahoma at the same time my uncle and I were going through it. Col. Dead Eyes—a diminutive man with the coldest eyes I have ever seen—was not in the least interested in the American Indian rarities shown him, in fact absolutely impassive until he reached the final room, the gun room, where Colt revolvers of every description stud the walls and a Gatling gun shiny as a toy sits in the center of the floor. Suddenly Col. Dead Eyes was a boy again! He beamed and grinned, crouching beside it to have his picture taken. Caramoor also provides the background for my new novel, Another’s Fool. Sidestep began with a friend’s telling me about the garden-supply mogul in his Indiana town who had privately revealed himself to be the local drug kingpin. The kingpin’s stated plan was to make enough money and then just disappear forever. My friend, awed, told me that it came to pass exactly thus: “One day, he just vanished!” I suspect the kingpin’s more likely to be moldering beneath a cornfield, however, than sailing the seven seas in a yacht per his intention. The idea for an art gallery as a money-laundering front is based, alas, on the all-too-real experience of a Louisville, Kentucky friend. Sidestep’s out-of-town drug dealers are modeled on those who daily resupplied my crack-dealer neighbor in Louisville. Like most of the drug dealers I’ve known, he was hapless and chronically broke despite selling to a steady parade of customers all day long; his cable TV was regularly cut off for nonpayment, sometimes the electricity, too, and when his car broke down it sat out front, never to be repaired. Meanwhile his suppliers brought their murderous looks into the neighborhood in caravans of bright old jacked-up Chevies with spinning hub caps.